According to the interpreters of the Holy Apocalypse, Andrew of Caesarea and Arethas of Caesarea, the woman of the Apocalypse clothed with the sun and which was a great sign, is according to some the Most Holy Theotokos, while others say it is the Church. 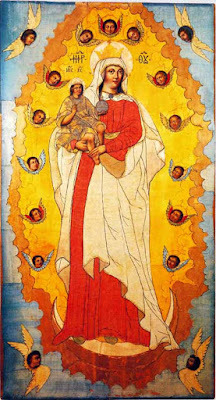 However, there is a connection between the Theotokos and the Church, because the person who unites both is Christ. 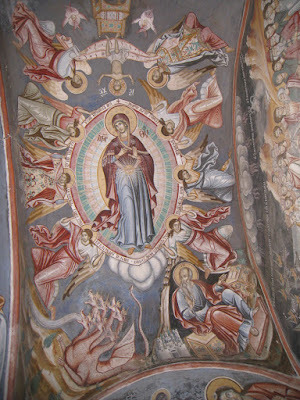 Andrew more interprets this woman to be the Church, while Arethas of Caeasarea analyzes it as relating to the Theotokos. Andrew of Caesarea writes: "Some believe that the woman refers generally to the Theotokos who suffered that which was soon to happen before her bearing of God was known. However, the great Methodius understands her to be the holy Church." Arethas of Caesarea also interprets her this way: "It is said this woman is the Mother of the Lord," because she is pure and free of all earthly things, and "he writes that in heaven, not on earth, she is equal to the angels." 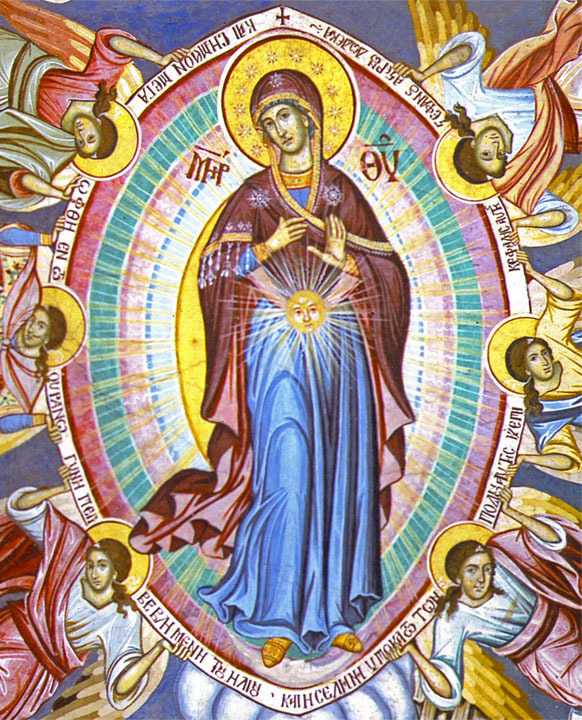 And Oecumenius, Bishop of Trikka, also writes that the woman clothed with the sun is the Theotokos: "He is speaking of the mother of our Savior, as I have said. Naturally the vision describes her as being in heaven and not on earth, as pure in soul and body, as equal to an angel, as a citizen of heaven, as one who came to effect the incarnation of God who dwells in heaven ('for,' he says, 'heaven is my throne' [Isa 66:1]), and as one who has nothing in common with the world and the evils in it, but wholly sublime, wholly worthy of heaven, even through she sprang from our mortal nature and being." Thus, there is a very close connection between Mary the Theotokos with the Church. There are wondrous analogies made by these two interpreters, Andrew and Arethas, who were both Bishops of Caesarea in Cappadocia. The sun which clothes the woman is Christ, who is the Sun of righteousness. We may perceive this "as clothing the holy Virgin with the noetic sun, namely Christ." That the woman is pregnant and crying from pain means the Mother of God "had the sun in her womb," and in this way shows "the child she bore was the Lord, who exceeded the house of the mother and all creation, covering or clothing the mother" (Arethas). Also, the Church has the Sun of righteousness. "Therefore, the Church is clothed with the Sun of righteousness." The Church "is in birth pangs for each one of those who are being born anew through water and the Spirit, 'until Christ is formed in them,' as the apostle says" (Andrew). The crown of twelve stars "are the holy apostles," who honor the Panagia and glorify the Church. The moon is "worship according to the law" which is demoted because it was defeated by the spirit of the Gospel" (Arethas). "Then another sign appeared in heaven: an enormous red dragon with seven heads and ten horns and seven crowns on its heads. Its tail swept a third of the stars out of the sky and flung them to the earth. 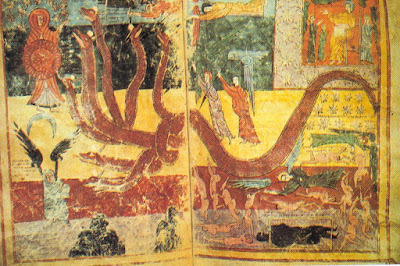 The dragon stood in front of the woman who was about to give birth, so that it might devour her child the moment he was born. She gave birth to a son, a male child, who 'will rule all the nations with an iron scepter.' And her child was snatched up to God and to his throne. The woman fled into the wilderness to a place prepared for her by God, where she might be taken care of for 1,260 days" (Rev. 12:3-6). Here also the two interpreters speak of the Theotokos and the Church. 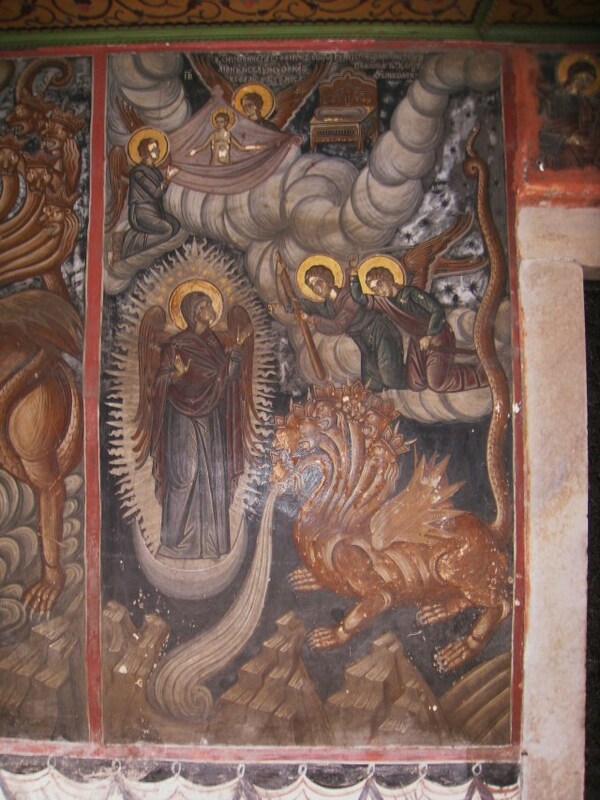 The dragon is Satan who is against God's Ten Commandments and uses heretics against the Theotokos and the Church. The venomous dragon urged Herod to kill the infants of Bethlehem and undo Christ. But the child with the help of Joseph, who received Him and His mother fled to Egypt, and so "escaped the hostile attempt" (Arethas). 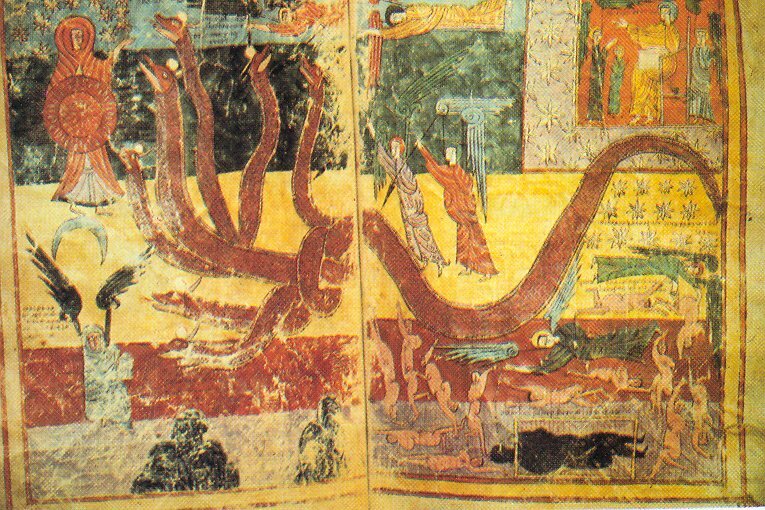 Moreover, the dragon is the the apostate devil who is armed against the Church. "The apostate always arms himself against the Church, desiring to make those food for himself who are being born anew from her. Rather, through the Church he persecutes Christ Himself, since He is the head of the Church, and He makes His own what belongs to the faithful... Through those who are baptized the Church is always giving birth to Christ, since in them He is being formed to the fullness of spiritual maturity, as the apostle says... The saints are caught up in the midst of temptations, lest they be subdued by difficulties beyond their powers." Then the elect, who despise political noise and worldly desires, flee "into the wilderness of all wickedness, bearing all manner of virtuous conduct." They even flee to the sensible wilderness, where those who are in the mountains, caves and holes of the earth are saved (Andrew, Methodius). 'Now have come the salvation and the power and the kingdom of our God, and the authority of his Christ. For the accuser of our brothers and sisters, who accuses them before our God day and night, has been hurled down. They triumphed over him by the blood of the Lamb and by the word of their testimony; they did not love their lives so much as to shrink from death. Therefore rejoice, you heavens and you who dwell in them! But woe to the earth and the sea, because the devil has gone down to you. He is filled with fury, because he knows that his time is short'" (Rev. 12:7-12). "When the dragon saw that he had been hurled to the earth, he pursued the woman who had given birth to the male child. The woman was given the two wings of a great eagle, so that she might fly to the place prepared for her in the wilderness, where she would be taken care of for a time, times and half a time, out of the serpent’s reach. Then from his mouth the serpent spewed water like a river, to overtake the woman and sweep her away with the torrent. But the earth helped the woman by opening its mouth and swallowing the river that the dragon had spewed out of his mouth. Then the dragon was enraged at the woman and went off to wage war against the rest of her offspring — those who keep God’s commands and hold fast their testimony about Jesus." The Mother of God escaped war with the dragon with her two wings, namely the promptings of the Angels, one of which took place with the Magi to not return to Herod, and the other so as to flee to Egypt (Arethas). Since the dragon/devil failed to fight the Virgin and kill her Son, he inaugurated another way, namely all that took place on the Cross, "to cultivate the passion of unbelief in the mother, and the loss of her Son through death." The river that ran from his mouth are the temptations the Theotokos went through during the Passion of her Son, which is the sword that pierced through her holy soul (Arethas). Still, the Church which is being persecuted by the devil, avoids the war with the two wings of the eagle, which are the two Commandments, and goes into the wilderness to live away from pleasure. And although the Church flees into the wilderness, the dragon makes a river appear of unbelieving men and wicked demons and various other temptations against the children of the Church who keep the commandments of God and the testimony of Jesus (Andrew). It becomes obvious that in this apocalyptic image the Theotokos and the Church are closely connected. Both have great glory coming from the Sun of righteousness, Christ. Both give birth to Christ, the Theotokos by giving her flesh to Christ, and the Church continuously gives birth, through her Mysteries, to children, brethren and friends of Christ. All of them are at war with the devil, but they face him through Christ by living in the wilderness of dispassion. The wilderness is the hesychastic life, the keeping of the commandments of Christ, the purity of the body and soul, and above all the garment that surrounds them, which is the glory of God. Unbelievers and heretics, who are instruments of the devil, cannot harm them. 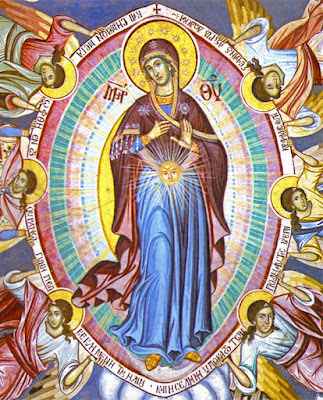 The Theotokos has great glory in the heavens, enjoying the glory of her Son, and the Church as the body of Christ is divinized, shining with divine glory. 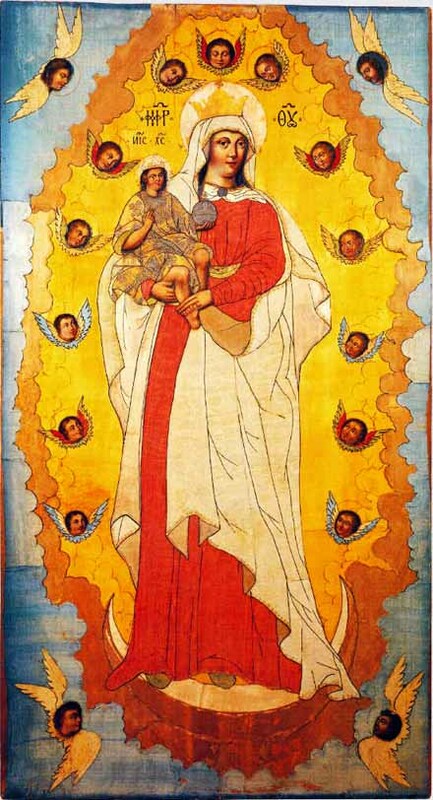 The feasts of the Mother of God are associated with the Despotic feasts, and are brilliant festivals of the Church, which illuminate the faithful Christians. Source: Ekklesiastiki Paremvasi, "Γυνή περιβεβλημένη τόν ἥλιον", July 2016. Translated by John Sanidopoulos.